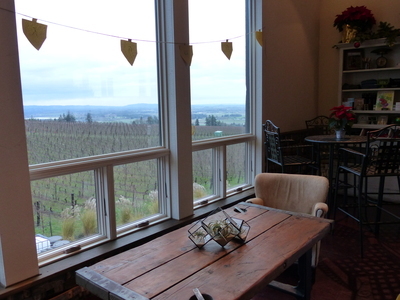 The vineyard at Brooks Winery & Tasting Room in Amity, Oregon is seen through a tasting room window. This image was taken during an oral history interview with Don and Carolyn Byard on December 11, 2015. The Byards were interviewed by staff from the Linfield College Archives. Linfield College Archives, "Brooks Winery Vineyard View" (2015). Browse All Willamette Valley Oral History Interview Photos. Image. Submission 93.